Gum disease is the single most prevalent disease in America, affecting about 80% of the adult population to some degree. More often than not, gum disease (also known as periodontal disease) can be attributed to insufficient oral hygiene. Brushing twice a day and flossing once a day, along with your regularly scheduled dental cleanings, go a long way toward preventing periodontal disease. When you brush your teeth, you wash away the plaque that has accumulated throughout the day. Plaque is a biofilm that consists of saliva, particles of food, and bacteria. Flossing removes plaque from between your teeth and along the gum line. If plaque is not removed, then the bacteria can begin to attack your gum tissue, leading to an infection. Gingivitis is the mildest form of gum disease, and periodontitis is the more advanced form. 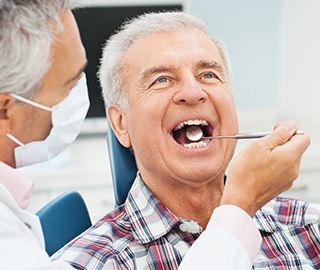 At first, you may notice that your gums are slightly swollen and reddened. They may also bleed whenever you brush and floss. As the condition continues to worsen and becomes periodontitis, the gums will begin to recede from your teeth, allowing pockets of bacteria to form. These bacteria can destroy gum tissue and the underlying bone structure that holds your teeth in place. Furthermore, research has shown that gum disease may be linked to a number of systemic health problems, including hypertension, stroke, heart disease, osteoporosis, depression, and pregnancy complications. At the dental office of Dr. James Olsen , we can use a diode laser for periodontal therapy procedures to fight gum disease. This treatment removes and reduces some periodontal infection. Laser periodontal therapy also promotes the reattachment of gum tissue to teeth, providing precise and conservative treatment. Because dental lasers promote comfort, some patients have found that they don't even need anesthesia during their treatment. We may also use an UltraSonic Scaler to treat gum disease. During this procedure, plaque and tartar are completely erased from the surfaces of your teeth, particularly along the gum line. Tartar is a yellowish or brownish substance that develops when plaque is allowed to remain on your teeth for a longer period of time. And, while you can remove plaque on your own with daily brushing and flossing, tartar requires professional cleaning. Our dental hygienists use special hand instruments called scalers and curettes and Ultrasonic Instruments to make your teeth cleaning appointments comfortable and effective. Using these, they remove hardened tartar and smooth the surfaces of your teeth so plaque and tartar are both less likely to adhere. In addition, Dr. Olsen may prescribe a topical antibiotic as part of your gum disease therapy in Ann Arbor. The antibiotic will be long-acting to ensure the complete eradication of the bacteria that led to your gum disease in the first place. Once you have received periodontal therapy, we encourage you to visit us more frequently for regular dental cleanings in order to keep this bacterial infection in check.